– Part of the LCD display is not functional but you can still see the patch name. – Comes with power supply. “Here is an excellent example of a Yamaha SY22. 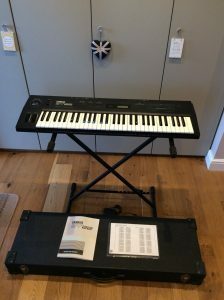 I’ve owned it from new in the early nineties and has always been either set up in a home studio or has been stored in a flightcase, a guitar flightcase, but it fits. It has one long standing battle scar which is purely cosmetic, it got a little too close to a light at a gig a long time ago and deformed the plastic in the top right of the case. This has never affected operation. 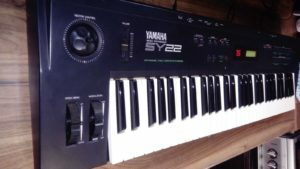 “Yamaha SY22 in good working condition, looks and sounds great – A Very pro bit of kit. “Keyboard is in great condition! Virtually like new, except for two minor scratches to the right of the LCD. Touring-quality hard case is in very good condition, with a few small blemishes consistent with use. Tested with another Power Cord. Turns on but not connected to speakers to fully test it. This was stored well and looks to be in perfect condition. 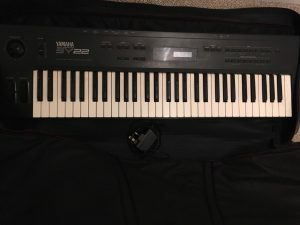 “This is a Yamaha SY22 and power supply. Works but two black keys do not. They appear loose and probably is an easy fix. I don’t know how to test all it’s functions. There are a few minor blemishes on the case, and a significant scratch on the bottom near the serial number label. The Yes/No/+/- buttons are presently non-responsive. 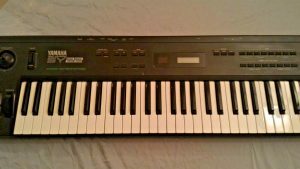 ” Up for sale is a Yamaha SY22 vector synthesis synthesiser. Fully working and in great condition all round. 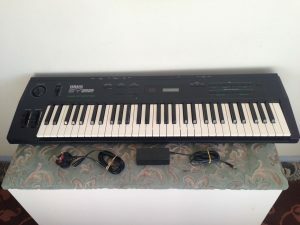 One of the white keys is missing, although there are plenty of spares on ebay for a few pounds. I never bothered replacing it as I had it hooked up through MIDI to my PC using SY Edit and Midi Quest. A power supply will be included although it will just be a generic one. A friend left me this when he moved, but I will never play it a quarter as well as he did the last time he played it. “This synth is flawless. It has never left my home studio. 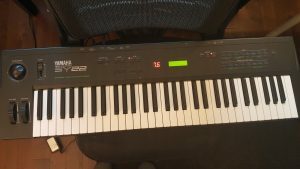 I’ve enjoyed this synth to produce many songs. all the features and operations in detail. It is in really good shape for its age. Cosmetically – no significant dents, scratches, or blemishes. I have it patched in to my stereo system via 1/4″-RCA plugs from the L. and R. outputs. ALL 64 (8 X 8) programs respond on this very clean keyboard. One can also listen with headphones via the 1/4″ jack on the rear panel. I cannot verify other possible functions (and there are many) since I lack any sound cards or Midi interface. 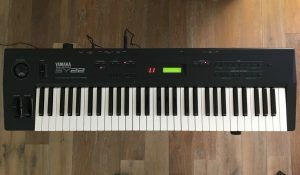 I can tell you that this is a very nice example of how Yamaha met demands for state of the 90’s tech. in an affordable package.